Cupcakes are seriously overpriced; in London, expect to be charged £2.50 for a handmade number. The problem I have is that too often the sponge is dry and the buttercream icing a little grainy and too sweet. They look great but taste a bit disappointing. And I want something with a little more depth than just boring sponge and icing! What’s more, you don’t need to wait for the block of butter to soften to make the sponge or the icing. Ordinary vegetable oil will do. Pimp up the cupcake with a rich chocolate ganache and you’ll never look back at those cupcake stands again. That means £2.50 saved for beer instead! Don’t bother with the stand or handheld mixer, this one only needs a bit of wrist power. If you’ve got children coming to visit, it’s worth getting them to help out, as the recipe is dead easy and you can act cool supervising. Ganache Ingredients: 350g semi-sweet good quality chocolate pieces, 300ml double cream, 1 small knob of unsalted buttter. Optional: 1 tablespoon of golden syrup if you want it sweeter and liqueur if you fancy sending the children to sleep! 1.Preheat oven to 180c. Line cases into cupcake trays…24 small cakes or 18 muffin…your choice. 2. Make the ganache: place chopped chocolate into a heat proof bowl. Pour cream and butter in small saucepan and heat on medium heat and when it comes to a boil, immediately pour over the chocolate and allow to stand without stirring for 5 minutes. Then gently stir the mixture to form a smooth paste. You can add a bit of liqueur and golden syrup at this stage if required. Allow the ganache to cool down as it will thicken. 3. Make the sponge: place all the dry ingredients in the bowl and give it a good mix to incorporate all ingredients. 4. In another bowl, add all the wet ingredients and whisk well to ensure they’re all incorporated. 5. Pour the wet ingredients into the bowl containing dry ingredients, and whisk until everything is combined. The batter should be thin and runny. 6. Pour the batter into the cupcake cases a quarter full only to allow room for the sponge to rise. Don’t be tempted to pour too much in as the batter will rise considerably and you’ll end up having to cut the tops of the baked sponge when you come to decorating. 7. Bake for 20 minutes at 180c or until a toothpick inserted in the centre of a cupcake comes out clean. Not all ovens were made equal so it’s worth checking before time is up. 8. Remove from oven and allow to completely cool on a wire rack. 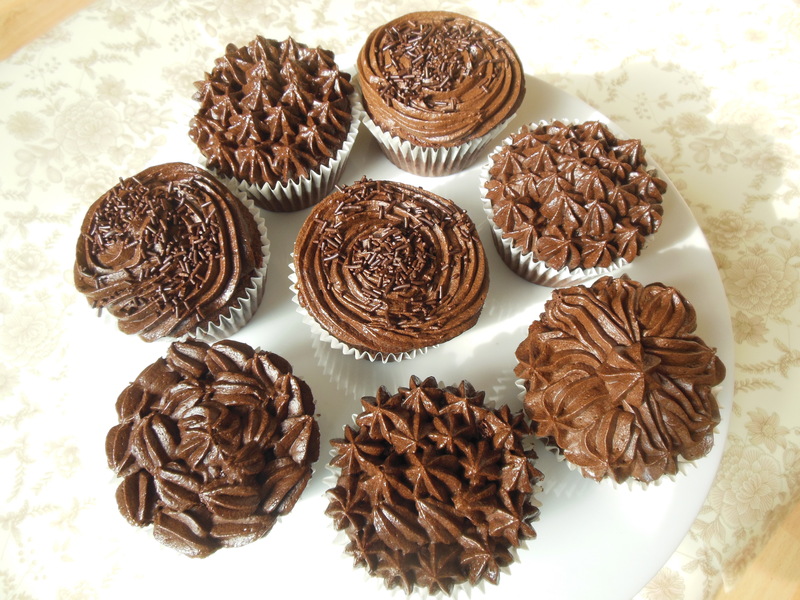 You can then ice the cupcakes by either pouring the ganache over the top of each cake or whisking the the ganache until light and fluffy, then transferring to a piping bag to decorate with a design of your choice. 9. The finished cupcakes can be put in the freezer for 30 minutes to harden the icing to prevent smudging, then transfer to a fridge to keep until you want to eat them! Next Next post: Squeezed from a bean!